Eddie Murphy who is 51 years old found a new girlfriend called Paige Butcher who happens to be an Australia model. Since there meeting two months ago, things having been looking rosy for the two lovers. I have heard so many criticized Eddie Murphy for dumping the other women in his life all because of Paige Butcher. Eddie Murphy before meeting Paige Butcher has dated Spice Girl Melanie Brown and film producer Tracey Edmonds but now he has part away with them. Eddie Murphy is looking so nice even at his age, he dressed casually with all black, Murphy held tight to his gorgeous girlfriend as they hit up a local Coffee Bean & Tea Leaf to pick up some refreshments. Butcher strolled alongside her beau in flip flops, beige skinny jeans, and a dark grey tank that showed off her slim waist and cleavage. Paige Butcher 33 years old Aussie bombshell is said to have dated hip-hop mogul Russell Simmons and model Tyson Beckford but presently now she is with Eddie Murphy in a relationship that seems working. She and Murphy posed for a pic at the carpet for the Eddie Murphy: One Night Only tribute in Beverly Hills. We cannot authoritatively said the exact way both of them met but speculation has it that the two of them met when Butcher had a small part in Murphy’s 2006 film Big Momma’s House 2. She has also appeared in Something’s Gotta Give in 2003. You never can say, the seed of their love might have been sewn since them and it now time for the germination. We just hope the new relationship will not go the same way the former relationship went. Eddie Murphy and Paige Butcher enjoy your new relationship life. Very Funny Conversation In My Girl Friends Father’s House; You Will Like! 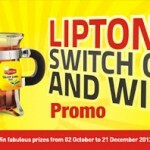 Only 15 Lipton Yellow Label Tea Tags in Lipton Switch On & Win Promo 2012 Could Get You the Ultimate Price of KIA Picanto Car, Other Great Prices Are Available for Win.